From the Shepherd Mountain marker, turn left (north) onto State Highway 21. After about 0.3 miles, turn right onto Main Street. Take the first right onto Industrial Drive. After about 0.4 miles, will be the intersection with N Main Street. Find a convenient place to park. Description: You are standing near the spot where units from Fagan's Division would move out to attack Fort Davidson. Many from Cabell's Brigade would reach the earthen walls of the fort, only to find that the ditch was too wide an deep for them to get across. 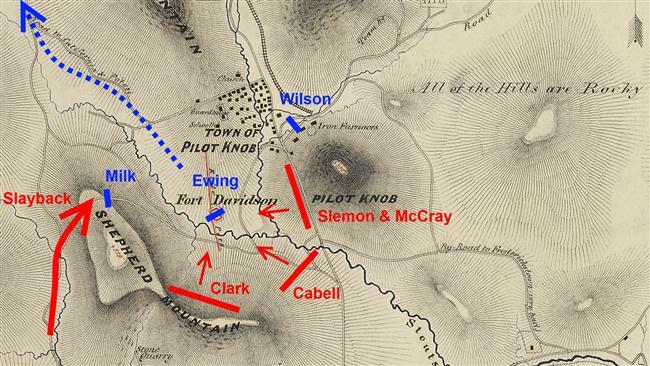 "The work was an irregular octagonal earth-work, called Fort Davidson, the faces being from thirty to thirty-five yards each with a bomb-proof magazine, the garrison apparently being about 1,000 men … I … suggested the following plan of attack of the position, which was to place six or eight field pieces on the crest of Shepherd's Mountain by hand, stating that the guns could be placed in position in about two hours on a point 1,200 or 1,500 yards from the work and about 300 feet above it; that proper support should be assigned for those pieces; that while that was being done the work should be invested by the remaining troops of the two divisions of Generals Marmaduke and Fagan, with the remaining four pieces of artillery; that I thought the route north in the direction of Potosi would be the natural line of retreat of the enemy if driven from the work. 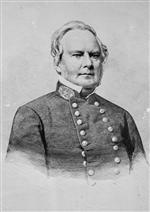 General Price concurred with me." "About noon the head of their column came around the point of the mountain in full view and changed direction, forming line of battle across the valley from Shepherd's Mountain to Pilot Knob and extending far up the sides of both mountains. They sent in a flag of truce and demanded our surrender; General Ewing returned a very polite but emphatic refusal. They then moved their line forward some distance, halted, and again demanded our surrender, saying that they would not be responsible for consequences in case of our refusal. 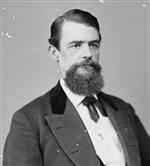 With unanimous concurrence of all the officers … Ewing answered that he would risk the consequences, and informed the enemy that he would fire on any flag of truce thereafter sent forward." "Marmaduke's division on the north slope of Shepherd's Mountain, about 800 or 900 yards distant from the work; Fagan's division on Marmaduke's right, its left resting on Shepherd's Mountain on a prolongation of Marmaduke's line, its right resting on the west slope of Pilot Knob Mountain, both divisions masked by the timber on the mountain and about equidistant from the work, Fagan a little nearer to it. Dobbin's brigade of about 1,500 or 1,600 men was in position about a mile due north of the work on the road to Potosi." "The dispositions were complete between 2 and 3 p.m., when a few rounds, five or six in number, were fired from the guns in battery on Shepherd's Mountain. Fagan's division debouched upon the plateau at a point about 500 yards distant from the work, where his whole line came under fire. Marmaduke debouched upon the plateau about 600 yards from the work. Several (say five) minutes later Fagan's division, after advancing about 100 yards on the plateau, broke in the most disgraceful manner, and before it had experienced any material loss, with the exception of Cabell's brigade, which was on the extreme left, which moved steadily across the plateau at double-quick and delivering its fire under the fire of five or six heavy guns, two six-inch Coehorn mortars, and two or three 2-pounder steel skirmish guns … The enemy's chief attention was directed to Cabell's brigade, which having reached a point in the vicinity of the ditch, and meeting with very heavy loss, fell back in very great disorder up the slope of Pilot Knob Mountain. Marmaduke, while Cabell was moving as described, moved from the southwest and west faces of the work, his command delivering its fire as it advanced. After having passed about 200 yards on the plateau in which the work is situated under fire of several of the guns of the work with but little effect on its line, the entire division halted and laid down on the dry bed of a creek about 250 or 300 yards from the work just before Cabell's line broke. About 4 o'clock in the afternoon the fight concluded, Marmaduke's division continuing to remain in the bed of the creek sheltered from the fire, the other troops retiring in great disorder, General Price using every effort to rally the troops in person." "I received an order from General Fagan to charge the fortifications, in conjunction with General Marmaduke. I moved to the charge on Marmaduke's right, as directed. My men had no shelter, but were in open ground for 1200 yards. Marmaduke's men took shelter in a creek with high banks. 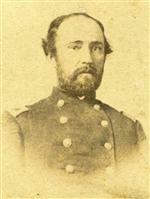 My Brigade was left without any support, and, on reaching the fort, found the ditch so deep and so wide that they could not scale it without ladders, and seeing that I bad no support from Marmaduke's or any other command, I ordered my men to fall back to shelter under a murderous fire from two 72-pounders and one 34-pounder, firing canister at us at short range, and subject also to the fire of an infantry regiment greater in numbers than my own. My horse was killed at the edge of the ditch. My loss was heavy in both killed and wounded. Forty-five officers and men killed; one hundred and ninety badly wounded and a large number slightly." "About September 27 we arrived at Ironton, after driving the enemy out of Arcadia, capturing a few Yanks with their major, who was in command. Cabell then had his artillery carried to the top of Shepherd Mountain, and a Missouri battery was placed on an opposite mountain. From either of these batteries you could look right down into the Federal fort in the valley, and we poor privates in the rank expected to see the enemy shelled out of that fort in double-quick time. It certainly could have been done in a few minutes; but instead of this, Gens. Price and Fagan ordered a charge. It was reported at the time that Gen. Cabell protested against it; but, of course, obeyed his superior officers, and made the charge over a thousand yards of open ground, without shelter or support. But Cabell's men rushed right up to the enemy's works, where they found a ditch outside twelve feet wide and eight feet deep, which made it impossible to reach and scale the walls, and there was nothing the men could do but fall back. Cabell's horse was shot from under him, and his loss was very heavy both in men and officers … This charge was one of the most unreasonable blunders ever made. There is no doubt about Cabell opposing this charge, it was a useless sacrifice of a large number of brave and true officers and men." "TThe signal for the assault was the opening of artillery on Shepherd Mountain. The fort lay directly in my front (as was supposed) one-half mile, but found the distance to be at least three-quarters of a mile upon examination afterward. The descent from the top of the mountain was as rugged as can be imagined, and it was impossible to move the troops down it in any order, huge boulders, fallen timbers, deep and almost impassable ravines confronting the troops at every step, and the enemy's artillery opening with great accuracy at this moment upon our disordered ranks … advancing to the very muzzle of the enemy's guns, found a deep ditch yawning before them impossible to cross. After some hesitation they recoiled before the terrible fire that was continually poured into their ranks, falling back from 75 to 100 yards from the fort under cover of a small natural embankment, and remained until after night-fall, when they were quietly withdrawn to an encampment one mile distant … Thus ended one of the hardest fought small engagements of the war." "[At 2 p.m.] a charge was ordered and made in the most gallant manner, officers and men vying with each other in both divisions of unsurpassed bravery, charging up nearly to the muzzles of the enemy's cannon … The information I had received in regard to the strength of the fortifications proved totally incorrect. Our troops were repulsed, and it being too late to renew the assault they were withdrawn beyond the reach of the enemy's guns and preparations were made for a renewal of the assault on the next day." 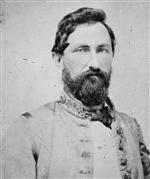 "We are in possession of Arcadia and Ironton, but in our attack on the works at Pilot Knob this evening were repulsed. It is the design of General Price to renew the attack to-morrow morning, and trusting that the courier sent this morning has reached you, we hope that you are en route for this point, so that you may co-operate. General Price desires that you move as nearly down the railroad as practicable to this point, and when you have arrived within striking distance of the fort between Pilot Knob and Shepherd Mountain that you signal us by firing three guns. When we are ready for the attack you will charge simultaneously. General Price is in possession of all the hill sides around Pilot Knob, and you will have no difficulty in communicating with us by the west, which you will please do as often as practicable." "I was opposed to making the charge when we did, and so informed the staff officer who deliver the order, as we did not give our artillery time to drive them out or to demoralize them as we should have done. A great mistake, which I tried to prevent, had been made, and my poor men were unnecessarily sacrificed. It made me feel sad to think that so many brave men had sacrificed their lives through bad generalship and a mistake in the strength of the enemy's position. We should never have attempted to take this fort by direct attack, but by getting behind them their capture would have been easy, as there was but one way for them to get out."